The Acer Aspire 5 15.6" laptop has all the essentials you need. 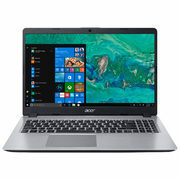 Equipped with an Intel Core i5 processor, 8GB of RAM, and integrated Wi-Fi and Ethernet, this laptop lets you quickly browse the Internet, manage your finances, or work from home. Its Full HD display presents images in rich colour and clarity.